PYEONGCHANG, South Korea -- The South Korean Paralympic team was officially admitted Tuesday into the athletes' village for the PyeongChang Winter Paralympic Games. A welcome ceremony for the South Korean team took place at the athletes' village in PyeongChang, some 180 kilometers east of Seoul, and 62 athletes and officials, including Vice Sports Minister Roh Tae-kang, attended the ceremony. The alpine skiers and wheelchair curling team members missed the ceremony due to training. South Korea was one of the first two teams to have a welcome ceremony, along with the Czech Republic. 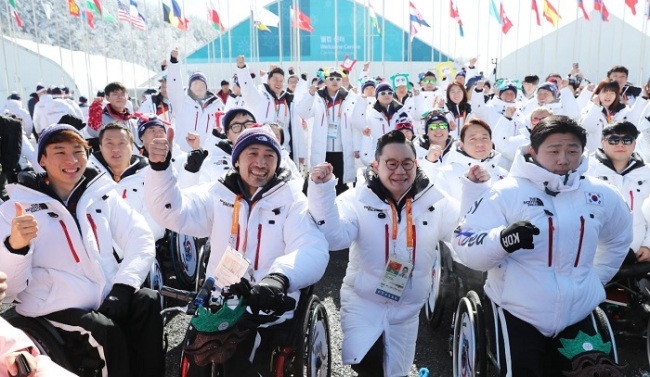 "As I'm also a person with a disability, I'm proud of all the athletes here and I want to thank you all for coming to PyeongChang," Park Eun-soo, the mayor of the PyeongChang Paralympic Village, said in his welcoming speech. "I expect all of you to fulfill your best abilities." South Korea is looking to finish in the top 10 at the PyeongChang Paralympics with one gold, one silver and two bronze medals. The country has yet to win a gold medal at the Winter Paralympics. The host nation is sending its largest-ever delegation to the Winter Paralympics, with 36 athletes and 47 officials in all six sports. South Korean chef de mission Bae Dong-hyun made a surprising announcement in his speech at the welcome ceremony that he will offer monetary rewards to the medalists. Bae said he will give 100 million won to gold medalists in individual sport competitions at the Paralympics, and 50 million won and 30 million won to silver medalists and bronze medalists, respectively. In team sports, the gold-medal winning team will get 300 million won, with 200 million won for silver winners and 100 million won for bronze medalists.